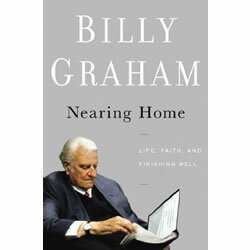 Those words, “Life, Faith, and Finishing Well,” are actually the subtitle of Nearing Home (2011), by Billy Graham. Most Americans recognize that name immediately. In fact, people around the world know of the famous preacher. For nearly fifty years, he held mass meetings in numerous large cities, and introduced millions to Jesus. His radio program, television broadcasts, and writings have further expanded his renown. After such a long, fruitful ministry, Dr. Graham has earned the right to tell us how to live well during our remaining days. He includes practical advice, to answer such questions as: When should I retire? What should I keep in mind as I plan for the golden years? What legal issues should I settle so my children won’t have to? ” Look for the Lord’s purpose in every circumstance and in every face or voice you encounter daily, for the time He has given you is not without purpose” (p. 38). “Whatever you do, keep your mind and your body occupied; don’t give laziness or boredom a chance to take root in your soul” (p. 47). “God designs transitions and provides the grace to embrace what follows” (p. 165). M-m-m. Such advice would be helpful for the high school graduate heading off to college or the workplace, just as much as the senior citizen! Billy also offers up much encouragement. He names numerous senior citizens of the Bible and draws attention to the work God gave them to do. Abraham was 100 when Isaac was born, and the foundation for the Israelite nation was finally established. Moses was 80 when he led the Israelites out of Egypt. Daniel was still serving as prime minister of the Medo-Persian empire, at age 80. Barzillai, age 80, helped to save the life of King David and his men (2 Samuel 17:28-29). Haggai wrote his book of prophecy at age 70. These men had probably slowed down a bit, compared to their energetic youth. (Moses is the only exception. Deuteronomy 34:7 tells us that, when he died at age 120, “his strength was not gone.”) All of us, sooner or later, experience that life-shift from speed to sputter! But slowing down is not the same as stopping. “Retirement should not put us on a shelf,” says Dr. Graham (p. 28). One option: lift up others who are carrying heavy loads. We can pray, encourage, and offer help as we’re able. “You’ll do best by filling your minds and meditating on things true, noble, reputable, authentic, compelling, gracious–the best, not the worst; the beautiful, not the ugly; things to praise not things to curse” (The Message). Again, just as applicable to a teenager as an octogenarian–and all of us in between. Because no matter how old each of us might be, our foundations of faith can always use reinforcing. Very true and always a blessing to remember. Thanks Nancy. Thank YOU, Janet, for being a loyal follower. Could I ask you to pray for our family? God has asked us to do a difficult thing. Please pray for wisdom and courage to move with Him into the calling. THANK YOU so much! Please forgive the tardiness of this reply. I’ve been out of state visiting family. I would consider it an honor to pray for you. Please keep me updated! ‘From speed to sputter’ !!! I love it!! I have told so many people that even if all they can do is sit in their chair, they can still pray for others. Nice thoughts, once again. Thank you, Grace. Yes, “prayer changes things,” even if we’re doing it from a rocking chair! Nancy, as usual, your message is very inspiring and a real nudge to get busy and do something productive. I always enjoy reading about Dr. Graham–whose name and teachings I have been familiar with for many, many years. Thank you for this reminder. Have a blessed day. You’re welcome, Ruth. I, too, am inspired by Billy Graham. What a glorious legacy he has built through the years! I find so much encouragement in this post, Nancy! Concerning we who are retired and living our senior years…(I certainly don’t ‘feel’ like a senior, but I digress! )…our lives are not over until they are over… And we should not be wasting the time that the dear Lord has earmarked for us. I love how Billy Graham notes that ”Retirement should not put us on a shelf,..and that we should lift up others who are carrying heavy loads.” I particularly appreciate how you can apply these concepts to all ages! Enlightening reminders are abundantly and eloquently presented in this post! Thank you so very much! Indeed–we can’t go wrong with advice from such a saint as Billy Graham. So glad you found the post encouraging! This post is great. Since I have retired, I tell others I have to retire from retirement. I love being busy, the Lord has given me good health to enjoy this time of my life. Thanks again Nancy for all you do. Love your comment about retiring from retirement! Makes me realize: even in retirement we must seek balance between work (although it may be as a volunteer) and play. You are a good role model, Laura!